Worry is a weapon Satan uses to shift our focus from God. His mission is to make us live in Fear instead of Faith because without Faith it is impossible to please God. When we worry, it means we have not fully trusted God to take care of our needs. 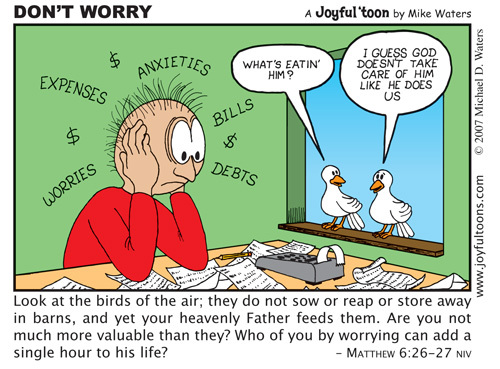 People worry about food and clothes, their safety, sicknesses and diseases, bad economy, fear of rejection, etc. The antidote for worry is having Faith in God. You have to trust that God has immeasurable resources to cater for your limited needs. In the next 7 days, I will share with you a wonderful series on “Living the worry-free life”. I believe it is going to bless your life so do share with others.